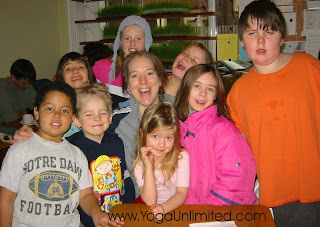 Home → Classroom Management → What is the Best Class Size for Your Young Yoga Masters? To get a reference point for a good kids yoga class size look at what daycares are required to do. If you Google the daycare ratios for your region or city you’ll find some standards. Here in Toronto, Canada the children to teacher ratio for daycares is pre-set. In a preschool (2.5 – 5 years) class it is 8 children to 1 staff. The school age (6 – 12 years) ratio is 15 kids to 1 staff. It is usually higher in schools programs. When I go into a daycare or school to teach yoga usually at least one teacher stays with me to assist. I have a couple classes in a summer program where I take 8 pre-school kids on my own, but truthfully it took me a number of years teaching kids before I was actually comfortable doing this. Who’s Your Backup In the Studio? In a studio or community centre I’ll open up 12 – 15 spots for enrolment. In a community centre, there are often other staff at the front desk who can help if kids have to go to the bathroom. If you are in a studio and alone with a large group, it can get tricky if someone has to go to the bathroom and the bathroom is in another area. Whenever possible I take the cell phone of the parents at the beginning of the class. Most people have a cell phone nowadays. I don’t mind if parents leave if they want to do something while the class is on. But if you are alone in a studio you may ask one or two parents to stay as a backup. Sometimes you may have to deal with something like a spontaneous nosebleed, and it’s good to have backup. With a lot of practice; I’m comfortable with a larger number especially if I know the group. Yet sometimes uncomfortable with that many – if I know that some of the kids are not into coming! Every once in a while you may get kids who are forced to go to class by their parents. The truth is not everyone likes yoga: adults or kids. But usually adults aren’t forced to go. If you want to teach a large group of kids, I also suggest you find a teaching assistant for the class!